Dhadak on Zee Cinema is the Highest Rated Movie of 2018! The World Television Premiere of the biggest romantic blockbuster of the year, 'Dhadak' on September 30 on Zee Cinema has established a new milestone in the Hindi movies genre. The movie garnered 18.32 million Impressions as per BARC data for Week 40 for 2+ audience in the HSM market and is the highest rated movie premiere of 2018. 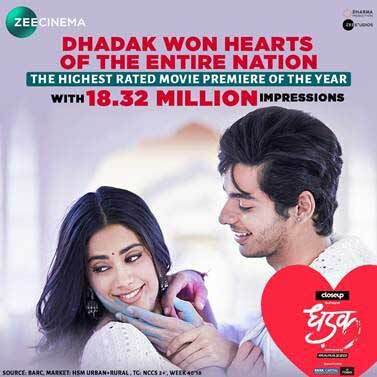 In the week of Dhadak's telecast, Zee Cinema was the No.1 channel in the Hindi movies genre and the Zee Hindi Movies Cluster boasted of a huge 40.01% viewership share in the category. The #ZingaatWorkout challenge kick-started by Zee Cinema, an amalgamation of dance and fitness was a viral hit. The challenge saw Janhvi Kapoor and Ishaan Khatter along with their friends from the industry perform mind-blowing work out routines on the tunes of the popular track 'Zingaat'. The unique fitness initiative gained huge traction and garnered a whopping response of 70+ Million impressions across social media platforms. In a one of a kind innovation, the channel also created the largest greeting card in the form of a hoarding in Mumbai and Delhi that captured real-time love message dedications sent to Zee Cinema's social media pages. Zee Cinema had also rolled out a robust marketing campaign across cities including television, outdoor, digital, radio, PR and on-ground mediums. Keep watching Zee Cinema – Home Of Blockbusters!